ABB’s Sensyflow series of thermal mass flowmeters is suitable for all industrial and test rig applications that demand quick and precise gas measurement. 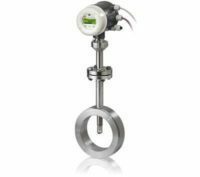 Sensyflow flowmeters directly indicate the mass flow or normalized volume flow of gases without any additional pressure and temperature compensation. The flowmeters have an impressively high accuracy, short response time and a very wide flow range with virtually no loss of accuracy even at the lowest flow rates.